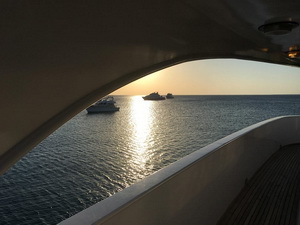 M/Y blue Fin is the first vessel in the blue o two Egyptian live-aboard fleet. She is 39m in length and takes a maximum of 24 divers on each trip. She went through an extensive refit early in 2016 and now has a great contemporary look and feel. All cabins benefit from en-suite facilities, air conditioning, mini refrigerators and personal entertainment systems and the 3 king suites also offer large double beds and bigger plasma screens. These king suites which dominate the bow on the lower and middle decks, spreading the whole width of the vessel – the perfect treat for couples. M/Y blue Fin is equipped with a nitrox membrane, booster pump and can also cater for rebreather divers. The Strait of Tiran & North cruise allows you to take in some of the most iconic wrecks and reefs the Red Sea has to offer as well as the pristine coral reefs of Tiran. The Tiran dive area is found in the entrance to the Gulf of Aqaba and is made up of four main reefs that form the top of an underwater bridge. These reefs, named after British cartographers (Jackson, Woodhouse, Thomas, Gordon), are world famous for their extraordinary diversity of corals and strong south westerly currents make them home to many large pelagic fish. Day 1 – Start the week with a check dive before heading north for an afternoon and night dive. Days 2-5 – Spend four days cruising the northern Red Sea. Normally you will have the opportunity to make three day dives and a night dive each day. The exact itinerary and order of dive sites will vary depending on the conditions but you can expect to visit plenty of wrecks including SS. Thistlegorm. There is also some fantastic reef diving including the Ras Mohamed and Tiran marine parks, Sha’ab El Erg (famous for dolphin encounters) and the island of Gubal. Day 6 – Enjoy two relaxed morning dives close to Hurghada allowing you to cruise into harbour in the early afternoon. Take advantage of an evening onshore to purchase souvenirs and enjoy Egypt’s famous hospitality before your journey home the next day. Also known as the ‘Ships Graveyard’, this reef is dangerously positioned close to the busy shipping lanes of the Gulf of Suez. This reef has claimed more ships than any other in the area. On the north side are four wrecks laying on a sandy seafloor at the bottom of a steep sloping reef layered with table corals. On the south side is a safe anchorage for live-aboards and two ergs, known as Yellow Fish Reef. This is a world renowned dive site, situated at the tip of the Sinai. Two small ergs are joined by a vertical wall dropping into the abyss. At Shark Reef the current allows you to drift along the wall, rich with colorful corals. Moving towards Yolanda Reef you reach a plateau scattered with small ergs and coral outcrops. Continuing around the reef you will come upon the scattered remains of the wreck ‘Yolanda’ complete with its cargo of toilets and baths. The whole of this area is big fish territory so keep an eye on the blue! This is the most northerly reef and on its northern edge lays the wreck of a freighter serving as a stark warning to ships in the narrow straights. Dives are usually conducted from the moorings on the south side which is sheltered from the main swell and currents. Moving northwards you will come across a forest of spectacular Gorgonia fan coral at about 20 to 30 metres as well as many different kinds of reef fish. This site can also be done as a drift dive heading from the mooring towards the East with the reef on the left where it is mostly wall diving with excellent corals. This is the longest reef of the four in the Strait of Tiran. Home to reef sharks and eagle rays, it is dived as a drift dive usually from South to North. Jumping at the southern part of the reef is a wall to about 30m covered with coral from the surface all the way down. There is a canyon going along the reef at about 25m which spreads out into a coral garden with sand alleys. This is the smallest reef in the Strait and diving here is governed by the weather as there are extremely strong currents. The ends are vertical walls with a large plateau at about 25m on the south eastern side. This plateau often has sleeping sharks on the sand patches and the colorful coral has a fence of Gorgonia fans at the end. This is the most southerly reef of the four and has a different topography from the others offering both a shallow plateau area and drop offs. A huge variety of reef fish and big schools of groupers can be seen here and on the sandy bottom at 4 to 5 metres there is an eel garden area along with coral encrusted drums. The top of the reef, with its lighthouse, is also home to the wreck Lovilla which sits almost parallel to the wreck on Jackson Reef. Includes: Return flights MAN/LGW*-HRG, Internal transfers, 7 nights full board accommodation on the vessel (with water, tea, coffee, soft drinks), all diving on 12ltr cylinder with air fills and weights. *Departure airport confirmed at time of booking.